How to install wrought iron panels to the posts? Installing iron fence is easier than other softer materials like wood because usually, you get them almost assembled when ordering. When it comes to wood, you get just pickets and poles you need to stick together yourself. They are also stronger and have a longer lifespan. Many wrought iron fencing companies will offer you help to assemble the fence, but if you think you have the right tools and experience it can be done by one person. Before you get straight into installing the fence, you need to make sure you got the basic tools required. You will need a level, measuring tape, a cutting tool for metal, quality drill or power driver, masking tape or a felt tip marker that will show up on a black fence, ratchet and socket set, center punch, metal file, hammer and rubber mallet. 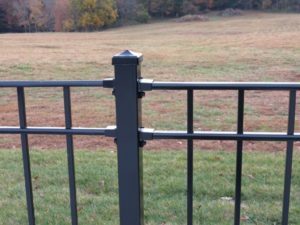 When you order the fence material you want, you will usually get a post and post cap, fence panel, fence bracket, self-tapping screw and some accessories companies usually send. Now that you know the tools you need and what you are working with, you are ready to install the fence. The first thing is to grab your fence panel brackets and slide them onto the fence panel rails in preparation for mounting it to the post. There are two types of iron fence brackets. The first is a standard bracket which is going to be used in 99% of installations and likely be the only type of bracket you will have to attach. The other type of bracket is an angle bracket. If you have an angled or curved section in your layout they will provide you with these in addition to the standard brackets. Angled brackets are wider at the base to allow for about 20 degrees of angling or curving as you go through the layout. Once you have your proper bracket selected, simply slide them over the end of the rail with a mounting tab pointing down at the ground. With your brackets slid on, the next step is to determine where you want to mount the fence panel on the post for wanted height. Normally, it is 2 to 3 inches off the ground. The reason for this gap is that if you are installing over grass, you want to leave enough space to get your weed trimmer underneath without raking it across the pickets and damaging it. With your height chosen, you are going to install the top bracket on each side of the fence panel first. To secure the bracket to the post you will need a self-tapping screw. If you look closely at the screw, you will see the head of it is a tiny drill bit. So, no pilot holes in the post are necessary. Next step is to slide your top bracket against the post. Another installation tip is to use a center punch before you start drilling your self-tapping screw. Simply place it where your screw is going to go and give it a solid tap with your hammer. This will indent the post surface and give the screw a place to bite into. Now you can use the drill. When you feel it went through, slow down the drill and live it slightly loose. You don’t want to fully tighten the screw just yet. Do the same for your top two rail brackets on each end of the fence panel. With the fence panel being suspended by the top brackets, grab a level and set the panel plumb before drilling your lower brackets. Place your level against one of the pickets and position the fence so that it reads plumb on your level. Once you have all the brackets loosely connected, go back with your ratchet and socket to tighten the screws. They only need to be snug, you don’t want to over tighten them and strip out the threads. Don’t be discouraged if that first one or two go a lot slower than you thought they were going to, once you get a rhythm down and get a couple under your belt, you are going to notice them going a lot faster than they were when you started.